The internet gives access to more information than ever before but not all of it is entirely to be trusted. To succeed in the information age we need to make sure kiwi kids can find and recognise reliable information. That’s where AnyQuestions comes in. We love working with clients who are making New Zealand a better place. So here’s the first in an occasional series highlighting some of their achievements. 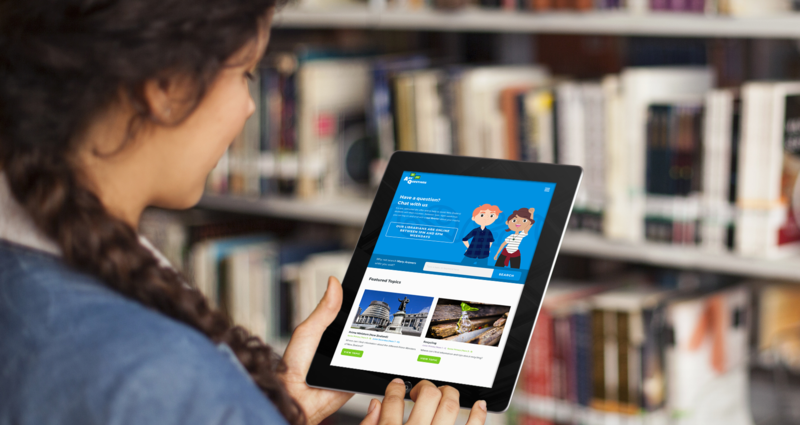 AnyQuestions offers free online schoolwork help for all New Zealand school students. It lets kids chat online with librarians who help the students find and recognise reliable sources of information, building vital information literacy skills. The AnyQuestions team knew they needed a tool that school-age children loved to use so they asked Boost to redevelop the site. By focussing closely on understanding and meeting the needs of schoolkids, we created a site that has seen usage jump by 74%. “We’re really happy with the new AnyQuestions. Students and teachers are delighted with the new site, finding it welcoming and easy to use,” said Rob Baigent, the National Service Manager of AnyQuestions. The AnyQuestions team sum up their service like this: Real time, real person, real help with homework. AnyQuestions is for schoolkids of any age, wanting answers to any schoolwork question, using any internet-connected device, anywhere in New Zealand. From 1 – 6pm weekdays students can engage online via text-based chat with friendly librarians from around New Zealand. Teachers can also book Classroom Sessions, where the librarian chats to the whole class. It’s a “teach a kid to fish” thing. Rather than find the answers for students, the librarians show them how they can find answers for themselves, and how they can assess the reliability of those answers. So that the site is useful even when the librarians aren’t online we integrated the ManyAnswers site into AnyQuestions. This partner site lists answers to common queries that have come through AnyQuestions. To make sure the service is safe and suitable to all ages, the librarians are all vetted and trained to provide the guidance that’s right for the student’s need and level. AnyQuestions is a collaborative effort, funded by the Ministry of Education, run by National Library and supported by libraries around New Zealand. integrate the ManyAnswers partner site. tested the work in progress with schoolkids. To make the site easy to use we were moving from a custom chat tool to a richly featured Software as a Service (SaaS) tool called LiveChat. This had to be an integral part of the students’ experience which meant we were embedding it in the site. Unfortunately this isn’t available out of the box with LiveChat. Luckily we were able to build a great relationship with the folks at LiveChat. They gave us access to the beta version of an embeddable LiveChat widget they were working on, giving us a nice headstart. The connection the students feel with the site was certainly borne out in the user testing. We were showing a prototype to a group of schoolkids. A boy pointed to one of the characters. “That’s me!” he said. And for us at Boost, it’s great knowing that our work is helping give kiwi kids the tools they need to thrive in the information age.